Most people don’t realize that there are many places where you can pan for gold just a short drive from Altlanta. Georgia actually produced more gold than any of the of the states in the Appalachian Mountains, and some of the areas just north of Atlanta were very rich with gold. Drive north to Cherokee County and you will be in the heart of Georgia’s gold country. Both The Little River and Etowah River contain placer gold that can be found by panning and sluicing. Several mines operated in this county during the 1800s. Gold was found in many of the creeks and rivers, as well as some of the hard rock sources that were mined. There are quite a few mines near Sixes. This was a hotspot during the gold rush in Georgia, and there is still plenty of gold that can be panned here. The portion of the Etowah River in Dawson County is a very rich part of the river. One very good area for panning is around Cummings in Forsyth County, north of Atlanta. Perhaps the best place is at James Creek, a tributary to the Chattahoochee River. Quite a bit of mining took place here during the early days. 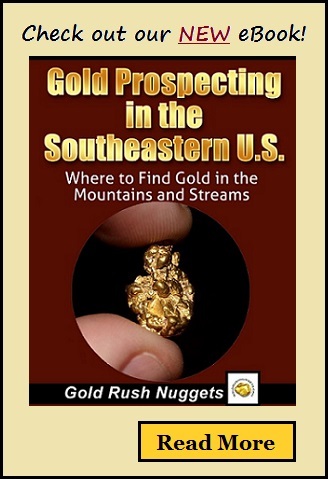 For gold prospectors who live in Atlanta and want to venture out of the city to find some gold, the closest gold-bearing waters will be found in Cherokee, Forsythe, and Dawson Counties. The downside of prospecting in Georgia is the amount of private property. Unlike the Western U.S., there are very few places where you will be able to go gold panning without first getting permission from landowners. There are also a few businesses that operate in north Georgia that sell access to gold bearing areas that you can use gold pans and sluice boxes to search for gold. Atlanta is close to some of the best gold mining locations on the East Coast. With a bit of research you can still find some really good places to pan for gold throughout Georgia. If you want to venture out a bit further, you can also find gold in Alabama, North Carolina, and Virginia too.